Whether it is one of these three men or one of the other diverse heavyweight candidates that are potentially running [like Senator Ted Cruz, business woman Carly Fiorina, Governor Bobby Jindal, and Dr. Benjamin Carson] I will support the choice of the people, whoever emerges as our nominee, and work for them with all that I have to defeat the Democrat nominee, probably Hillary Clinton. Eight straight years [at end of 2016] of this Democrat rule under Barack Obama must be turned around. 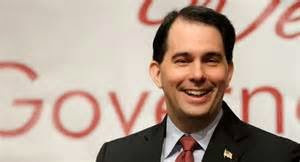 Governor Scott Walker seems to be the hot choice now having all the momentum at this time. We have done a couple of posts how Scott Walker seems to be talk radio giant Rush Limbaugh's choice for the GOP nomination. I would have no problem if Governor Walker becomes the GOP nominee, as I feel he would be a very strong candidate and could win the presidency. If Governor Walker does win the GOP nomination I would hope he would strongly consider Senator Marco Rubio as his running mate. That would be a powerful team of two young charismatic heavyweights from two of the most important states needed to win in the electoral college, that would be very hard to beat. The reason Tales is not going with him at this time is because he has not yet demonstrated that foreign policy is one of his strong suites [which I feel will be important in this election]. Governor Jeb Bush, who is not a favorite of much of the grass root conservatives, is nevertheless one of the strong leading candidates for the nomination, and would be a very strong candidate against Hillary Clinton in the general election. While he is not my choice, I believe he also could win [although in his case it would be more dubious] in the general election, like I believe both Walker and Rubio can win. There is one main reason I really oppose his getting the GOP nomination, and no it is not even his support for "common core" education or for his seeming support for amnesty for illegal immigrants. It is that, like Romney, he is just to nice to take on Hillary Clinton aggressively that is needed. Hillary Clinton will have no trouble firing all barrels attacking the GOP nominee and we need someone who can fight fire with fire. I am convinced Jeb Bush is not that person from just a comment he made the other day. A reporter asked him about his "private e-mail" account as Governor, and he explained how he did everything right turning over everything. But then the reporter asked the former governor what he thought about Hillary's secret e-mail list, and Jeb Bush just mumbled something about, "I don't want to talk about Hillary, I'll let her speak for herself" What? Are you kidding me Jeb. You better as hell want to talk about Hillary if you get the nomination, because she sure as hell will be talking about you, smearing you any way she can. I love Mitt Romney and love how both he and Jeb Bush act like true gentlemen. But like Mitt Romney was too nice to really attack president Obama, and it hurt him badly as it turned out, we cannot afford another "nice" guy not wanting to attack Hillary. The Tales loves Senator Ted Cruz, as demonstrated by this blog was one of the first [if not the first] to support his effort for senator in the primary against David Dewhurst in Texas, and we endorsed Cruz when he was in single digits in the polls. But I feel that he is just out of the top 3 at #4 right now, and while I love this great senator, in my gut I feel he will not quite be there at the end. I would love to be proven wrong, and if I am and he comes out on top, I will be proud to support the great Senator from Texas. Carly Fiorina and Governor Bobby Jindal, are both good candidates who I really love and would support them all with everything I have if one of them got a surprising win, but in this year with so many other strong candidates, that almost surely won't happen. While Senator Rand Paul is popular with some of the younger Republicans and others with a libertarian bent [and also those not wanting America to take a strong leadership role on foreign policy], that will not play well with grass roots conservative Republican primary voters and I believe that will rule him out of getting the nomination. I love Dr. Ben Carson, but because this election is tending towards a national security election, certainly not close to Dr. Carson's strong point as was demonstrated on the Hugh Hewitt show on Wednesday March 18, 2015, Dr. Carson will not really have a legitimate chance to be nominated. So, the Tales pick for the GOP nomination and for the president of the United States: Senator Marco Rubio of Florida. We, at the Tales [i.e., me], feel that Marco Rubio will not only be a great candidate for president, but will be the strongest candidate of all the nominees in this super GOP field. It is not just the fact that we feel Senator Rubio will be the strongest candidate who can win against the Democrat, we also believe that he would make a great president of the United States. Senator Rubio is an impressive, great communicator who we have compared favorably in previous posts to President Ronald Reagan, the great communicator. The GOP has been looking for a long time for the next Ronald Reagan, who can effectively communicate conservative principles and in bright bold colors state the cause of good vs. evil in the world, and I believe we may have him in Senator Marco Rubio. As a side benefit, we have here a young handsome Hispanic with a great family story who is from the critical state of Florida. When you add to that this man's great communication skills of conservative principles who has charisma, you have, in my opinion, the strongest potential GOP nominee since Ronald Reagan. A Walker/Rubio ticket would be great, but I believe a Rubio/Walker ticket would be unbeatable. Senator Rubio is strong not just on economic issues but maybe more importantly in this election, a strong national security senator who strongly supports the state of Israel as the Jewish state. Unless there is a drastic change in world events for the better in the next few months [and the odds of that are zero and less than zero] the 2016 election will be a national security election [just as the Israel election turned out to be]. There is no one on the GOP side who can articulate the national security issues better than Senator Marco Rubio. He would destroy Hillary Clinton in a national security debate. I believe he would also destroy her in an economic debate or on any other issue for that matter. I can tell you all about Senator Rubio's great communication skills but that tells you nothing compared to letting you hear the man himself in his own words. Now let us hear Senator Marco Rubio's communicative skills and demonstration of his knowledge on foreign policy issues and his unwavering support for the Jewish state of Israel. Now just today, Thursday March 19, 2015 Senator Rubio took to the Senate floor to give another riveting defense of the Jewish state while he blasted the president's obnoxious and detrimental behavior towards the state of Israel. This speech should make every true friend of Israel stand up and cheer. Note: Thanks to C-Span and the Washington Free Beacon for this video on You Tube. not only has strong tea party ties, but also appeals to establishment with his leadership style. Senator Rubio, with his clear straight forward communication skills, will, I believe, appeal to the independent unaffiliated [party] voters. He also, I believe, will be the best GOP candidate to compete strongly for the ever growing Hispanic vote, as did President George W. Bush. Plus, Senator Rubio will have a huge advantage in his home state of Florida, a state the GOP must win to win the 2016 presidential election. 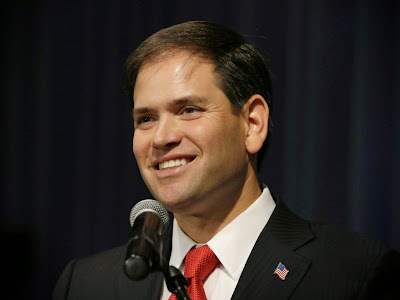 I truly believe that Senator Marco Rubio could be the best Republican candidate nominated for president since the great Ronald Reagan, and therefore, Tales wants to be the first blog to officially say that we strongly support Marco Rubio for the GOP nomination for president for 2016. In one of the more memorable lines from Marco Rubio's exciting announcement on April 13, Marco Rubio said: Yesterday, the candidate from yesterday [i.e., Hillary Clinton] promised to return us to yesterday. Well, yesterday is over! Rubio/Walker 2016! That's a winner!